I’ve been having fun submitting posts lately to Works For Me Wednesday, sponsored by We are THAT Family! I also get great ideas from the other posts over on Kristen’s blog. Today, the tip that works for me is sooooo simple! 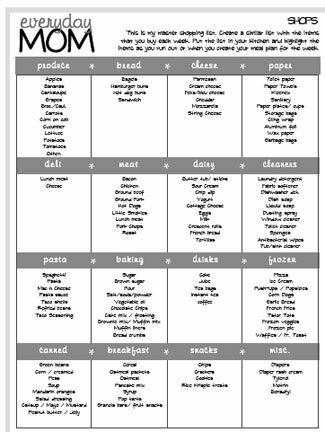 It’s my printable grocery shopping list. I made up a list of everything I buy at the grocery store on a regular basis. I organized it by section of the store in the order that I walk through the store. I keep several of these printed out and I hang them with a magnet on the side of my fridge. Each week, I can go through the list and highlight or circle whatever I need that week. It also helps my husband if he ends up being the grocery shopper because the list is organized so he can find things. The shopping list is part of my everydayMOM planner. And, by the way, I will be seeking your input on the colors and format of my 2010 planner very soon! If you would like me to e-mail you a free copy of my shopping list along with a blank copy you can fill in with your own list, just leave me a comment with your e-mail… or leave me a comment and then send me your e-mail: emilyneal at comcast dot net. Do you have a tip that makes grocery shopping easier?? I would love to hear about any system that works for you! Don’t miss a post. Subscribe in a reader! Free copy please! !I was going to ask but was debating if i should. I would also like a free copy. Thanks so much! Yes, yes, yes, send me a copy! You Rock!! Hey Ladies… if I don't have your e-mail address and it's not on your blog, make sure your blogger preferences are set to include your e-mail address when you leave a comment so I can send you the file. Or you can e-mail me your e-mail address or include it in the comment. My e-mail is emilyneal at comcast dot net. THANKS! Hey Becky,I can't access your blogger profile and my stats show that you live over in Indiana. Do you maybe go to church with my in-laws? I live near Chicago! I was just at the store today and it wasn't fun. I just can't seem to find a good system. So…I would love a copy. I think my email is on my blog, but just in case…sbabetz@yahoo.com is the address. Thanks so much. I have really enjoyed your blog. You can save your money while shopping at supermarkets by using printable coupon from http://www.clickmycoupon.com and get discount offers on your favorite products and services.